As I mentioned yesterday, we had a fantastic weekend kicking off our wedding with a chef inspired shower! The BOY and I were thrilled to open our gifts and before we even arrived back home, we had swung into Target for ice cream ingredients. It was after an evening of wine and pinning that I decided we needed an ice cream maker. We started with the simplest recipe…just a few ingredients. The BOY whipped everything together using some of our brand new measuring cups! He placed the bowl in the fridge for 2 hours while we finished cleaning and unpacking and then sat down for Thai. After dinner, the BOY started looking up ice cream information and discovered that you have to freeze the bowl over night before you can make anything. What? That should be in big bright letters on the front of the box. Sadly, we realized that ice cream would have to wait until the next day. Luckily, there were other toys to play with, like a deep fryer and rice cooker! 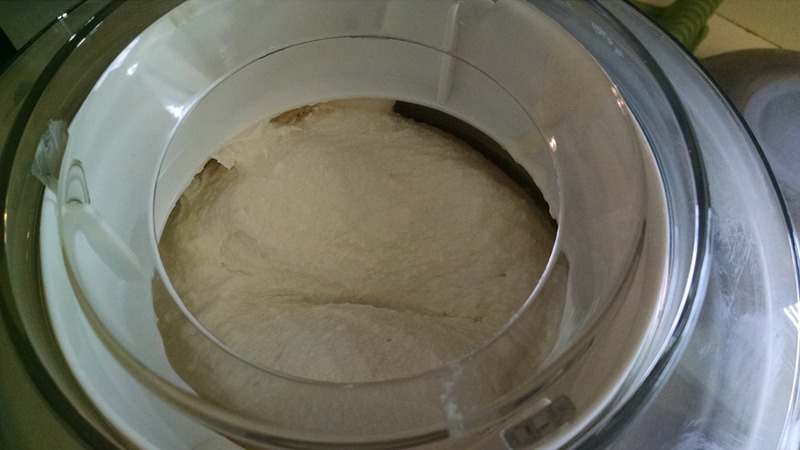 This morning, I was only awake a few minutes before the BOY whipped out the bowl of ice cream and placed it in the ice cream maker. Who doesn’t want ice cream for breakfast?! By this afternoon, the BOY decided that he wanted to make another batch. Before I knew what was going on, he had out pots and egg separators, whipping together a custard. Which waiting in the fridge now to become ice cream batch number two. I’ll let you know how it turns out! But so far…the verdict is…homemade ice cream is the BEST! Do you make your own ice cream? In a medium bowl, use a hand mixer on low speed or whisk to combine the milk, sugar and salt until the sugar is dissolved. Stir in the heavy cream and vanilla. Cover and refrigerate 1 to 2 hours, or overnight. Turn on the Cuisinart® ice cream maker; pour the mixture into the frozen freezer bowl and let mix until thickened, about 15 to 20 minutes. The ice cream will have a soft, creamy texture. If a firmer consistency is desired, transfer the ice cream to an airtight container and place in freezer for about 2 hours. Remove from freezer about 15 minutes before serving. We used to have homemade ice cream all the time. Chocolate chip mint is great. Also mint cream made with the white & red candies. The best is coffee. I remember the coffee ice cream! It was my FAVE! Do you have any of those recipes?! OMG so funny!! I did the same thing the first time I used my ice cream maker!! I didn’t understand why it had to be in the freezer!! 🙂 I love making ice cream! I haven’t made any in a while but I got a recipe the other day I want to try!!! Have fun with all of your new toys!!! So fun! Oh what recipe? Do you have any faves? I just found one with coconut milk I can’t wait to make…mmm! AH, how fun!! I need one of these.